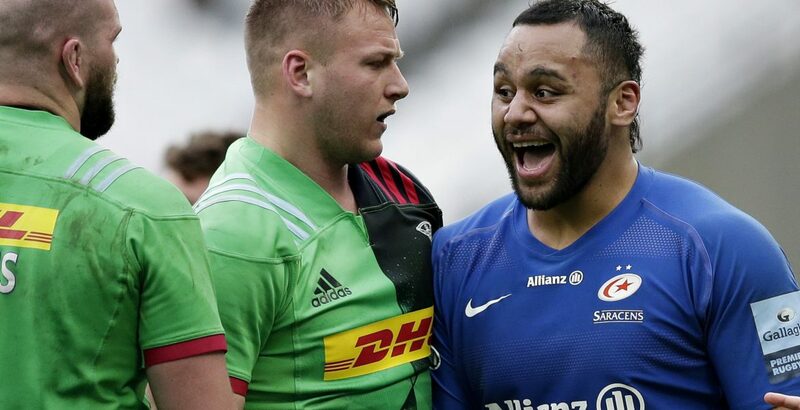 Saracens overturned an 11-point deficit to beat London rivals Harlequins and take a big step towards securing a home Premiership play-off semi-final. Quins led 17-6 at half-time, with tries by Marcus Smith and Danny Care putting them in control at London Stadium. Having endured an error-strewn first period, Sarries looked a different side after the break, Schalk Burger and Will Skelton crossing to make it 20-20. Skelton then touched down again to give them victory in front of 43,000 fans. Mark McCall's side now have a 13-point advantage over Harlequins, who slipped a point behind Gloucester in the table after their win over Wasps. Saracens' victory was not without controversy as several tight, but major, calls went against them either side of half-time. Care's score, sniping around the side of a ruck, came after centre Alex Lozowski had kicked the ball out of play thinking the clock was red, when it was ruled that there was actually one second remaining. Sarries then had two tries disallowed - the first after referee JP Doyle felt he had impeded Chris Robshaw's attempted tackle on Billy Vunipola before the England number eight crossed, and the second when Care and Liam Williams became involved in a scrap off the ball as David Strettle touched down. Care and Wales full-back Williams, whose misdemeanours did not appear to have any direct influence on the action, were subsequently both sin-binned for foul play. The decisions did not seem to impact upon Saracens, however, and they eventually converted pressure into points when Australia lock Skelton twice bundled his way over. Harlequins, who dropped to fourth in the table, have now lost two successive matches after a run of five Premiership wins in a row. "The players were really calm and clear at half-time about what we needed to do better. "There was a big curve ball just before half-time when they scored that try to make it 17-6, but the reaction of the team in the second half was fantastic. "It was a good first 40 minutes, but not even an average second 40. We were almost the worst version of ourselves. "We've got a point and our season isn't defined by Saracens away, but this was frustrating." Saracens: Williams; Strettle, Lozowski, Barritt (capt), Maitland; Goode, Spencer; Lamositele, George, Koch, Skelton, Isiekwe, Wray, Burger, Vunipola. Replacements: Woolstencroft, Barrington, Judge, Kpoku, Earl, Taylor, Malins, Tompkins. Harlequins: Brown; Earle, Marchant, Tapuai, Chisholm; Smith, Care; Marler, Elia, Sinckler, Symons, Horwill (co-capt), Clifford, Robshaw (co-capt), Dombrandt. Replacements: Ward, Boyce, Collier, Merrick, Bothma, Hidalgo-Clyne, Catrakilis, Alofa.